We don't usually visit cities, as I've said before: they're more churches, plazas, and museums. But, I've always wanted to have a romantic gondola ride in Venice. So, H took me there for my birthday! Northern Italy has been fantastic, and Venice has been too. We entered in the North after crossing the Alps from Austria, but then we wanted to do more mountains passes so we crossed again into Switzerland and did the Stelvio pass (of which I've already written). 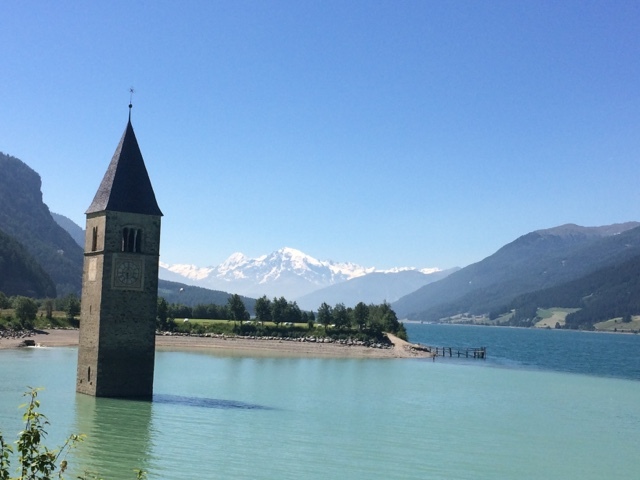 To make Lake Resia, the Italian government (of many years ago) flooded the valley including some villages. You can still see the church tower from the village of Resia. We visited my new favourite gardens : the gardens of Trauttmansdorff gardens, in Merano. And stopped in to see Otzi (the 5300 year old iceman that they found the corpse of in the Alps). And then Venice. Of course Venice isn't a place for motorhomes, so we stayed in a campground at Punta Sabbioni, which is on the peninsula in front of Venice, and caught the public transport ferry into Venice itself. This works out to be a great option. Venice was every bit as great as I'd hoped it would be. 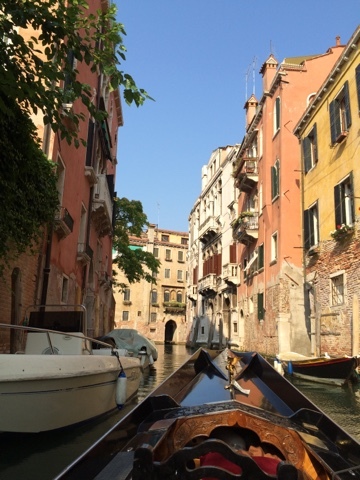 Yes, it's packed with tourists, but we found some quiet back lanes and hired our gondola away from the crowds (and didn't meet another gondola while we were in the small canals). So, Venice was a success! and then we packed and headed north to find some cooler climates. I'll tell you about Slovenia into next post.